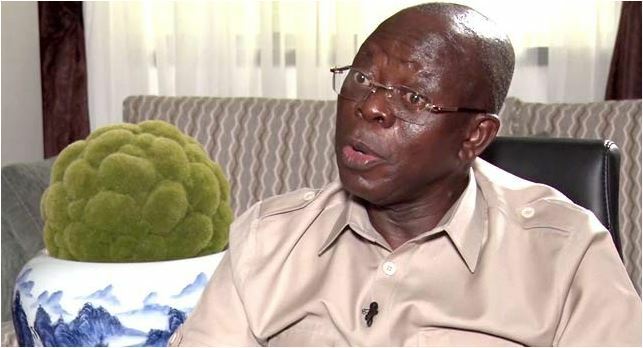 National Chairman of the ruling All Progressives Congress, APC, Adams Oshiomhole, has accused some top ranking members of the party of frustrating his plans to reposition it, alleging a gang-up on their part to remove him from office. In a statement released by his Chief Press Secretary, Simon Ebegbulem, Oshiomhole assured that the party under him was in safe hands as it marches, sure-footed, to victory in the 2019 general election. In the last few weeks, some party leaders and state governors have accused Oshiomole of high handedness. Members of the Oshiomhole-led National Working Committee, NWC, have been accusing the National chairman of treating them as errand boys and summoning them to statutory meetings of the party in his private office. One of the party’s presidential aspirants, Alhaji Mumakai Unagha, over the weekend, granted an interview on Saturday, and said that the party will find it difficult to win the forthcoming general election with Oshiomhole as national chairman. “The totality of Unagha’s claims, without necessarily addressing them one after the other, tallies with cooked-up narratives being sponsored by some influential stakeholders in their respective states that Comrade Oshiomhole is responsible for all the problems in the APC at the moment. Plot to sack Oshiomhole. These influential stakeholders, according to grapevine, have begun to mobilise to pass a no-confidence vote on the leadership of Oshiomhole, having failed to impose their preferred candidates on the party in the nomination process. Comrade Oshiomhole did not become national chairman of the governing party to bring it down a notch from the pedestal of its 2015 electoral victory let alone to preside over its liquidation. Rather, his single-minded goal, from the outset of his declaration of interest in the position, was to deploy his capacity in helping to strengthen and reposition the party as a truly supreme and disciplined political entity. Although, it might appear fortuitous to some persons that he became national chairman at the threshold of the 2019 general election; the truth is that there is no accident in predestination. “We must appreciate the fact that it has pleased the Almighty God to place him in the saddle of APC leadership at this time for a purpose. The purpose has begun to manifest in its vast flourish and ramifications: instilling discipline, ensuring party supremacy, promoting due process, dealing with impunity and executive arrogance wherever they manifest to undermine intra-party electoral processes in the states. “From the outset, we never expected that those who cherished and supported the status quo, which Comrade Oshiomhole supplanted, would cave in easily under the magnitude of the current political revival that he spearheads”. ”Indeed, while the progressives are enamoured of change, the conservatives find it difficult to embrace it. That is the current reality in the deliberate effort to rebrand the APC. “Again, we were not, in the least, deluded that the process of rebranding or rewriting the narrative of the four-year-old party would be easy. What we are witnessing in the APC today is Comrade Oshiomhole’s adroit management of the strains and pains that accompany the birth of a resuscitated governing party. “The leadership provided in the recently-held primary elections, and the large-scale integrity of the processes are developments that should hence serve as exemplars in the administration of governing parties. “Indeed, the message therein is very clear that the party, and not pseudo political empires in the states, has the power to superintend the primary elections for the nomination of the party’s candidates in the general election. While the party will not surrender its functions, which are constitutionally circumscribed, to any other entities, it will always be ready to moderate the divergent tendencies and mediate the disparate political camps in the interest of party cohesion. This is one of the hardnosed truths that the Comrade Oshiomhole-led NWC preaches and practises with an apostolic zeal to the chagrin of some influential stakeholders in the states. Comrade Oshiomhole envisions an APC that is capacitated to pragmatically build a corpus of leadership and membership that do not only submit to the high ideal of party supremacy but also the credo of party discipline. These-party supremacy and discipline- are two fundamentals that had been eroded even before the emergence of the Oshiomhole leadership. It is sad that while the national chairman is working round the clock, some stakeholders have thrown selfish political agenda into the mix to threaten the building of institutional capacity for the APC. Rather than resort to needless perfidy at the threshold of a general election, we call on them to imbibe the spirit of sportsmanship, bolstered by the fact that the Oshiomhole leadership is propelled more by its interest in propriety in which victory for the party could be grounded. The crime committed by Comrade Oshiomhole’s leadership is its disdain for impunity and circumvention of due process perpetrated in some of the states at the pleasure of some influential stakeholders. “Overall, Comrade Oshiomhole has not, since stepping in the saddle, taken any unilateral decision in the running of the party affairs. All decisions, so far taken, passed through the mills of NWC deliberative sessions and enjoyed unanimous resolutions. The records are there. History will justify Comrade Oshiomhole and posterity will vindicate him.